Sonic Junction is thrilled to welcome The Prince of New Orleans, Piano Legend Davell Crawford to our teaching team. 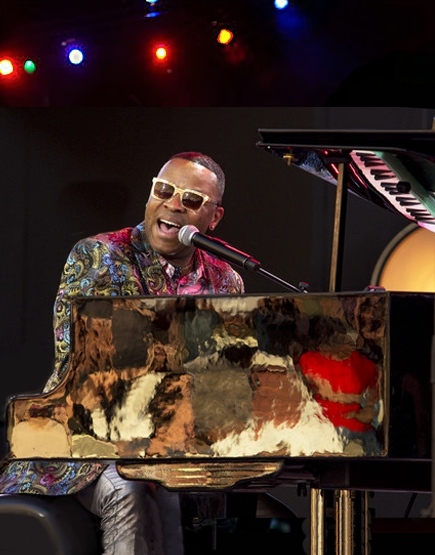 The embodiment of New Orleans’ spirit, genius, and tradition, Davell is recognized as “one of the most talented musicians alive.” For three decades, Davell has been electrifying audiences worldwide with his skill on the piano. Davell‘s mastery spans beloved Louisiana classics to work fusing his influences in jazz, blues, gospel, zydeco, soul, funk and beyond. Davell is at home playing jazz standards, leading a gospel choir, or composing new songs; they are all transformed by Davell’s exuberant perspective. Hailing from a line of musical showmen, Davell grew up in New Orleans immersed in its musical tradition and playing piano since the age of 2. Davell’s grandfather was ‘Sugar Boy’ Crawford, author of the famous song “Iko Iko” and extended family includes many music royalty -- Davell grew up hanging out and making music with Fats Domino, Irvin Mayfield, Allen Toussaint, Ellis Marsalis, C.J. Chenier, Roberta Flack, Lionel Hampton, and Dr. John, among others. Davell‘s appreciation for his extraordinary upbringing fuels his commitment to music education. As a leader in the music communities of New Orleans and New York City, Davell frequently plays in and organizes blockbuster tributes for his music mentors. In New Orleans, Davell founded a program for music enrichment, and is currently involved with the Harlem School of the Arts. We are delighted Davell is passing on his remarkable music heritage by teaching piano lessons here at Sonic Junction. Davell Crawford, "Ray Charles Days"
Davell Crawford, "Please Send Me Someone To Love"